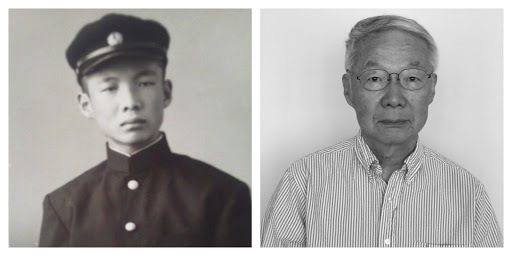 Left: Norimitsu in high school. Right: Norimitsu, July 2018. Photos courtesy of Mariko Kato (niece) and John Hsieh. Norimitsu Tosu was born in Hiroshima, Japan in April 1942. On the morning of Aug. 6, 1945, he and his twin brother were washing their hands when they were knocked flat and pinned under the collapsed walls of their bathroom. Over 140 pounds of uranium-235, dropped from the U.S. bomber “Enola Gay,” released an amount of energy equivalent to the detonation of 16,000 tons of TNT over the city of Hiroshima. The initial explosion immediately destroyed everything within a radius of one mile and instantly killed about 80,000 people (almost a quarter of the city’s population). Shockwaves, firestorms, and radiation further devastated Hiroshima, destroying 90 percent of the city and resulting in the deaths of tens of thousands more over the following days and weeks. Norimitsu is my grandfather. I’ve heard this story many times from his wife (my grandmother) and daughter (my mother). Four of his siblings, who were in school at the time, were out in the city and were killed. One of his sisters was staying with a relative out of town, and another was 20 years older and had already married and moved away. His father was temporarily being held in the city jail, which was a strong structure that shielded him from the blast. Norimitsu, his twin brother, and his mother had just come back from a walk outside when the bomb dropped. Had their walk lasted a few minutes longer, they would not have lived. Norimitsu was incredibly lucky to survive. Now, 73 years after that horrific date, he recounts his experience of the a-bomb, and his thoughts about it from the past seven decades. What happened to you and your family on the day of the bombing? Some of us were killed, and the others survived. What were the days and weeks after the bombing like? Honestly, I don’t remember exactly what happened or what it was like in those days because I was only three-years-old. But from what I heard from my mother, everything was gone and dead people were all over. Most people were hungry, sick from the effects of the radiation and burned — well, everything was in confusion. We were always hungry, and the weather was so hot. Everybody wanted water to drink, but it was very difficult to get some because the infrastructure was broken. What was life like five to 10 years after the bombing? It was said at the time that no trees, no plants would grow after the bomb. But soon after the bombing, trees and plants and everything came alive, and in four or five years many people built cottages to live in and they tried to get better medical treatment. In about five years, I think, life was something like normal. At that time, when I was 8-years-old, I was in school. I found many of my classmates in very bad condition — they wore no shoes, they didn’t have much food… We were supposed to bring lunch, but half of them couldn’t bring lunch to school. Their clothes were broken and dirty. I was in a fortunate situation because my father was a relatively wealthy man, and he could bring everyday needs to our house. We had food, water and shelter. Other people were not so lucky. Along the seven rivers in Hiroshima, there were a lot of shacks. Barracks. In those areas, life was terrible. It was 10 or 15 years before those shacks got cleaned up and taken away. Even though, as you said, you were young and don’t remember much, are there any particularly vivid memories you have of your experience? When we were evacuating, there were dead horses, dogs, animals and people everywhere. And the smells I remember. There was this terrible smell. It smelled like canned salmon. So for a long time after that, I couldn’t eat canned salmon because the smell reminded me of that. It was sickening. So more than anything I saw or heard, it was the smell that I remember the most. Obviously the experience of the a-bomb was a very traumatizing, negative ordeal, but do you have any positive memories of the whole situation? Everything was gone, so there were lots of places where we could play. Rivers, streams, brooks, where lots of fish swam, that we could take and catch. There were fruit trees that we just took from as we wanted and ate. Everyone was so busy worrying about their own business that no one paid attention to what the children did. We could do whatever we wanted and go anywhere without getting scolded. We could go into someone’s yard and take a persimmon, and no one would complain. Because there were no buildings or structures anywhere, it was just all this open nature. We could play in the waterfalls or do sports in the wide open fields. Do you think that the use of the a-bomb was at all justified? Not at all. Not justified. Never. Ever. A lot of things in this world are relative, but the a-bomb is an absolute evil that no one can justify. It’s indiscriminate killing. No reason is capable of condoning such an action, and the fact that the United States still to this day hasn’t apologized is also highly indefensible. Japan acted very cruelly, especially to those in Asia, and we apologize — formally, informally and very often. Germany apologized to the world every time they were accused of doing cruel things. But only the United States hasn’t apologized for what they did. We are all victims, even people in the United States. Lots of their soldiers were killed in Asia, in Europe. Nobody is victorious in war. To right those wrongs, we have to accept them. And the a-bomb was an unjustifiable, unnecessary, evil crime against humanity. Even if the United States has never apologized for the use of the a-bomb, do you forgive those who were involved in its use? I don’t feel any kind of enmity against the people of the United States. And the pilots and engineers in the plane – they couldn’t imagine what would happen, and in any case they were carrying out actions they had been ordered to perform. It was the politicians and the leaders of the army and the navy who made these decisions. These people are to blame. Do you think that, overall, the world is making progress towards peace? In a way, yes. I think that people in the United States are becoming aware that using atomic bombs or hydrogen bombs would be catastrophic to humankind. What about recent developments on the Korean Peninsula? Do you think that’s a natural obstacle that we have to overcome, or a step back? It’s definitely a step back. I am really afraid that the present administration will use nuclear weapons on the Korean Peninsula. Their policy is so unpredictable that anything, even an accident, might cause the drop of nuclear weapons. Do you think that the problem here is that we’re becoming complacent, and we’re not as committed to peace as we have been? That this “if it happens, it happens” dialogue is a sign that we’re becoming so disconnected from the realities of war that we’re not as concerned as we should be? Yes. That’s why it’s so important for Japanese bomb survivors to use their voices and tell the people of the world what happened. And I think they are doing that. I think people are capable of recognizing the cruelty of war. And to that end, education is a must. To teach people history and how not to repeat it. You think that people, given the information they need, will make the right choices? Yes. I do. But first, we have to do something about nationalism. We have to change the doctrine of “this country” and accept the idea of one world people. Everyone is adopting this view of “progress.” We have to stop favoring this concept, and we have to seek some way of living together peacefully without consuming more and more and competing with each other. We have to think that the whole world is one nation. We can’t keep living the way we are, with every country chasing its own “progress” without regard for others. It will kill the earth. Do you think complete peace is possible, or is some conflict inevitable? Complete demilitarization is ideal. But in reality, as long as there has been human civilization, there has been human war. The difference is that in the old days, we had duels of honor with pistols and swords. Then, the people would see blood and understand what they were doing. But now, we have the remote, button-pushing, bomb-dropping war that indifferently kills masses of people. That must be stopped if we are to survive. When we get to the point where we kill people like bugs without any feeling in our conscience, we have to do something or else human society will perish. How do you think we can fix the problem of this mechanical, remote warfare that you describe? I think that if any country decides to go to war, there must be a rule that you send your own family first. I think then war would stop entirely. If you had to send your own wife, your own child into battle, then it brings up this sense of ownership and personal stake in this conflict. It’s a similar case with the death penalty — something that among advanced countries, only the U.S. and Japan have. The people who commission the death, who sentence the defendant, should be present at the scene of execution. If we don’t make these things happen, it’s unacceptable. It creates the sense that the suffering of other people isn’t relevant to your own self. So the sentencer must be there to see the sentence carried out. If you’re going to declare war, those people doing the declaring should be the first on the field. Then they would realize — it’s not us and them. It’s just people. People who are suffering because we can’t understand that they are just the same as us. Undoubtedly, the people who can make the most difference in carrying out this vision of peace are the youth. Do you have any message for the Fountain Valley students reading this article, as well as for the new generation of the world in general? I really want young people to think independently about politics. When I was young, I despised politics and politicians, and I always tended to think about more abstract, philosophical things in life. But when I was a college student, I realized how important it was to be involved in things political and to act in accordance with one’s beliefs irrespective of one’s field of specialty. One more thing. I have always told my students to find something in life that no one can take from them — like reading, or writing. In a long life, there will be a lot more sorrowful, depressing things than joyful events, but that inalienable thing that you find and choose to make yours will help you to find yourself. Norimitsu Tosu is now a professor of linguistics in Tokyo. He has a doctorate in anthropology. He spends most of his time in Japan, but stays in the U.S. several months out of the year in his home in Fountain Valley. He and his wife have three children. His two sons live in Oregon, as a former director of a Catholic worker house, and Myanmar, as an employee of the United Nations’ World Food Programme. His daughter, a pediatrician, lives with her family of five in Fountain Valley. Seven decades have passed since Dr. Tosu lost his home and four of his siblings. In that time, eight more countries (in addition to the U.S.) have developed functional nuclear arms programs. Fortunately, however, the cases of Hiroshima and Nagasaki remain the only two military uses of nuclear weapons in human history. Despite several uncertain moments and barely averted disasters, the efforts of diplomats, world leaders, humanitarian advocates and ordinary people committed to peace have delivered us a surprisingly and blissfully nuclear-free 73 years. Yet taking this stability for granted is perhaps the greatest danger our world currently faces. In the past year alone, unwinding nuclear security agreements, reckless and inflammatory political rhetoric and careless foreign policy have brought us dangerously close to the edge of nuclear catastrophe. They have shown us that the calm and peace we expect is far easier for us to shatter than it was for us to build. They have reminded us of the danger of complacency, and the imperativeness of vigilance. As Dr. Tosu says, we cannot afford to remove ourselves from the conversation. If we care about our beliefs, we must take initiative, be involved, and act to defend them. Today, the world has a population that has gone an entire lifetime free from nuclear war — us. The choice we face is to reaffirm our commitment to saving the world from a fate we ourselves have been fortunate enough not to experience. We need to take the stories of people like Dr. Tosu to heart and realize that the games we are playing are far too dangerous and far too real to handle lightly. Otherwise, we will be forced to learn the horrors of nuclear warfare firsthand, with weapons far deadlier and more powerful than the single bomb that destroyed Hiroshima. That is a mistake we cannot make, and one we certainly will not survive. If this hell on earth is to be prevented, then our duty is simple. Left: Norimitsu and two of his friends in high school outside the A-bomb Dome Memorial. Right: Norimitsu, his grandson and son-in-law in front of the building, Dec. 2017. *Some parts of this interview have been translated from Japanese.